On Making Art by Paul O’Kane on the act of making and the making of the act The notion of creativity has been subjected to rigorous critique in the postmodern era but the act of making – the business of negotiating the idiosyncracies of the artist’s chosen medium – still remains central. In the digital age, however, the media of mundane labour and creative expression are often the same, so is it time for artists to reconceive the act of making and the making of the act? The Artist as Cynic by Sophie J Williamson writes in praise of shamelessness.The scandalous Cynics of ancient Greece lived a life free from social restraint, speaking their minds – and indeed performing their bodily functions – in public and thereby exposing the hypocrisy and political motivations underlying most social conventions. Many performance artists, such as Marina Abramovi&cacute; and Cosey Fanni Tutti, have utilised similar techniques, but in an age of voluntary and involuntary surveillance through social networks, how have artists such as Christoph Schlingensief and Ai Weiwei tapped into the spirit of the Cynics for political protest? The programme is hosted by Matt Hale who has worked at Art Monthly since 1991. 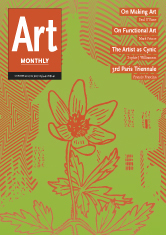 Art Monthly magazine is indispensable reading! This entry was posted in Art Monthly Monthly, Uncategorized and tagged & flip/flop (Fat Chance John Cage), 1995, 2001, 2002, Ai Weiwei, artist's chosen medium, Bruce Nauman’s Mapping the Studio II with color shift, clicktivism, Corneila Parker’s The Maybe, Cynic, Cynics, Cynics of ancient Greece, Diogenes barrel, dot-com multimillionaires, flip, flop, Gilles De La Tourette, Josh Harris, Marina Abramovi, On Making Art, Paul O'Kane, Roland Barthes, Sophie J Williamson, the act of making, The Artist as Cynic, The Death Of the Author, the digital age, The House with the Ocean View, the making of the act, The notion of creativity, Tilda Swinton, walking, Walter Benjamin on October 16, 2012 by artmonthly.